You are here: Home / Ethnic Groups / The People of Sumatra / Who are the Enim? The Enim people group live in South Sumatra. Most Enim people live along a section of the Trans-Sumatra Highway stretching from Muara Enim City to Muara Meo Village in Tanjung Agung District. The Enim believe that they originated from a supernatural being that lives in the forest. Most of the Enim who live in villages make a living by collecting sand and rocks from river beds, which can be sold. Some Enim travel around the area selling the sand and rocks while others sell their products from kiosks. Those with a primary school education or lower usually do this work. Another common activity is harvesting firewood from the forest. Dry wood is collected and split into smaller pieces. Many Enim also work as nabah para or nabah balam who taps rubber trees to obtain the sap. The family’s oldest son, who is regarded as having the most rights to the inheritance, usually inherits wealth left behind by parents. However the father may also choose to divide the inheritance between his sons. Daughters do not receive inheritance rights because they are considered to have been bought by their husbands at the time they are married. As a result, a woman’s inheritance comes from her husband alone. Marriage is carried out according to Islamic principles. There are three forms of Enim marriage. The first is Tanam Batu, which means that the groom joins the bride’s family. The second is Kepalaking, which means that the bride joins the groom’s family. The third is Tambe Anak Samarizing, which means that the bride and groom can live in the place they prefer, so there is no tie to either family. The Enim are very open to newcomers. Enim people are free to form relationships with anyone regardless of ethnic or religious background. This openness has led to many mixed marriages with people of other ethnic and religious backgrounds. Almost all Enim people are followers of Islam, which has been handed down from one generation to the next. 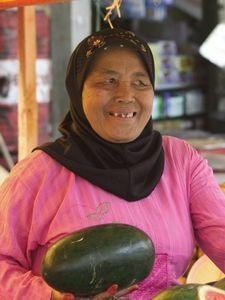 The Enim follow Islam because their ancestors chose it, but some Enim people still practice the traditional beliefs of their ancestors as well. Heaven and hell are understood to mean that which is good or bad in this world. Heaven means having a good or comfortable life. Hell means a difficult or unpleasant life.